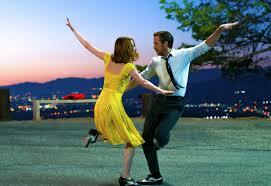 Although it plays on the tropes of golden age musicals, La La Land isn't really a musical in that sense. The leads are not great dancers - to have been so would simply have been cheesy. Their modest hoofing is approachable, which seems right for what is, in effect, a two hander. It is a very clever thing to have made so intimate and ordinary a story on such a cinescopic scale. The hilltop dance scene (six minutes - one shot - the one in the posters) was done on location. The artifice is the artifice of reality (that sounds a bit pseudy, I am aware, but it rather sums up the movie's appeal). The story itself is rigorously anti-sentimental, which plays brilliantly against all the expectations we bring to the genre. No, it isn't Singin' in the Rain, nor meant to be (and anyway, Singin' in the Rain is more or less the greatest of all movies in the history of the universe, including all parallel universes). As for the performances - dancing aside - Ryan Gosling's is wonderfully generous and understated, while Emma Stone's first audition is alone worth studying - for once a movie audition that isn't played cod - her character can really act. We are transfixed by Stone's brilliant acting until we become aware that behind her, blurred, a minion is knocking at the glass office door with a sandwich for the casting director, and we are ourselves torn, distracted. The film's cameras linger; there are shots that last minutes on end, so that all the action is in the performance It seems like a film put imagined beforehand and not put together in the cutting room. It also continues a theme that impels 'Whiplash' - that to be your best self, sacrifice must be made. La La Land is not simply a floaty floaty pastiche; it is a proper tale beautifully told.